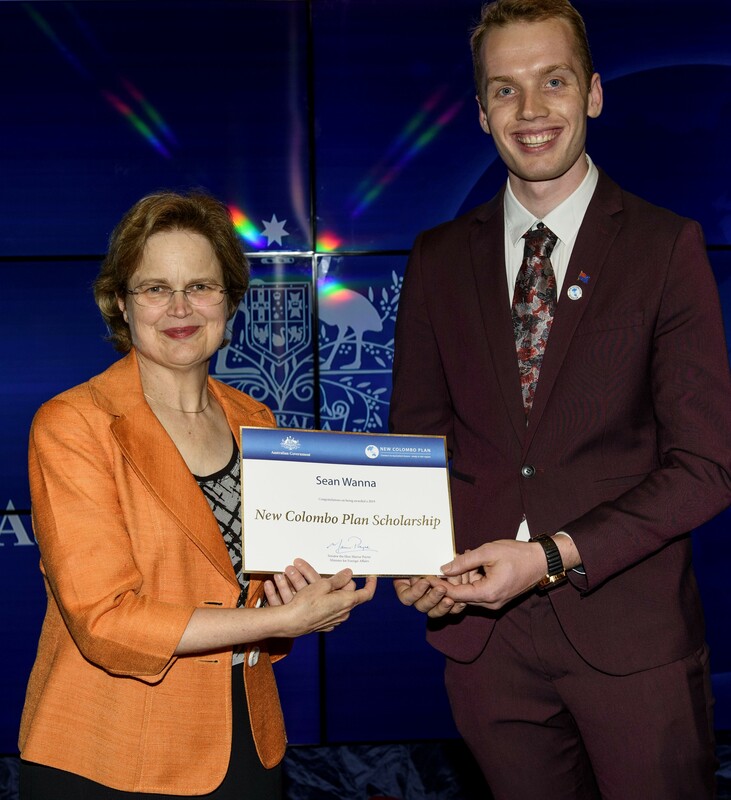 Three QUT students are off to Asia after Foreign Affairs Minister Marise Payne last night (November 26) announced the 2019 recipients of Australia’s prestigious New Colombo Plan Scholarships. Sean Wanna (Bachelor of Design – Honours), Maddison Simpson-Treichel (Bachelor of Business – International) and Bryce Devlin (Bachelor of Business – International) were all awarded scholarships to represent Australia and QUT abroad next year. The scholarship will enable them to each spend a semester/year studying overseas and also complete language and internships during their trip. Sean is off to Taiwan to spend semester one at the National Cheng Kung University and plans to intern with a product design firm to learn about the Taiwanese design industry. “I will network with as many design and manufacturing firms as possible during my exchange, and I intend to write a series of articles from an Australian’s perspective on the Taiwanese design industry,” he said. 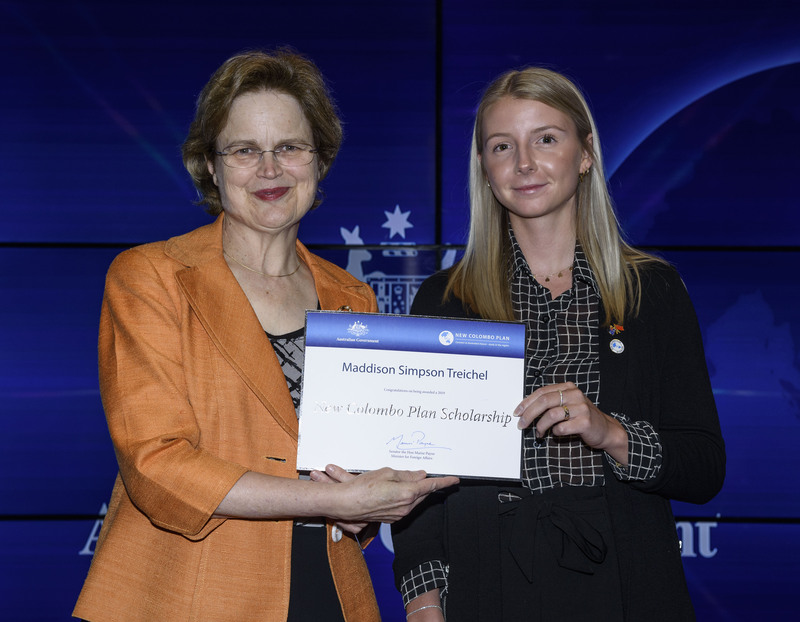 Maddison will return to China – where she spent several years of her childhood with her family – to attend Shanghai Jiao Tong University for one year commencing in semester two and hopes to also intern at Austrade or Austcham. She said she wanted to rekindle her understanding of the Chinese culture, develop her Mandarin skills and network with people in relevant industries. “In the future, I hope to work in trade facilitation, such as sourcing or importing and exporting,” she said. Bryce is bound for Hong Kong, where he will spend two semesters at Hong Kong Polytechnic University and then intern with a logistics leader. 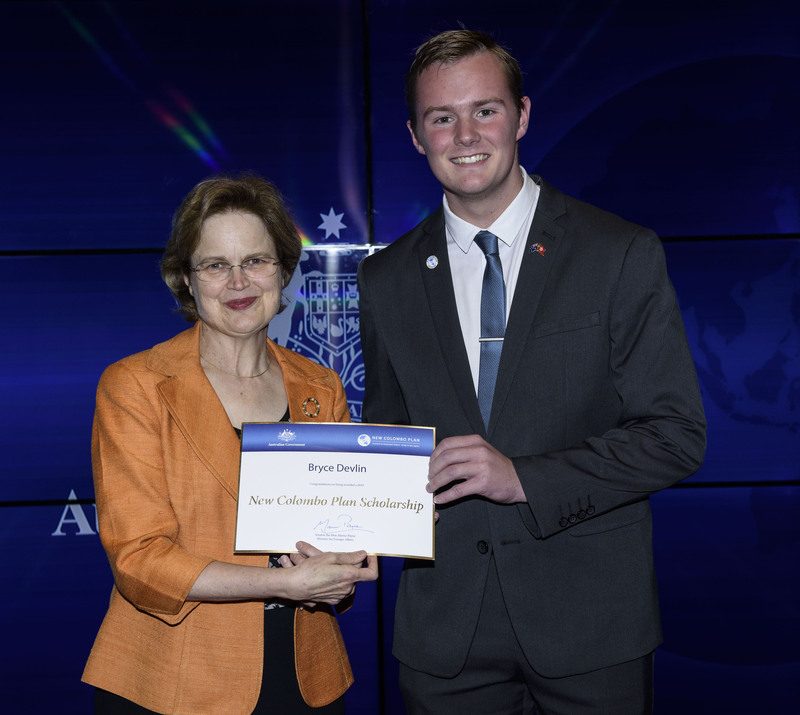 Frances Adamson, Secretary of DFAT with QUT student Bryce Devlin. “While studying logistics and language courses at PolyU, I intend to actively learn about the Internet of Things and the role it plays in enhancing supply chain efficiency,” he said. The New Colombo Plan Scholarships are funded by the Australian Government to strengthen Australia’s links with Indo-Pacific nations. Nationally, 125 scholarships have been offered for 2019.